Here and Now Spring 2016 has arrived. Click the link or image below to read and download this edition of the American Zen Association newsletter. The American Zen Association includes member sanghas in Louisiana, Mississippi, and California, and individual members throughout the country and beyond. Here and Now is intended for AZA members and groups, affiliated groups in Europe that share our lineage through Master Taisen Deshimaru, and anyone else interested in our traditions. Here and Now keeps us all informed and connected across distances. It is a record of our practice and our practitioners. 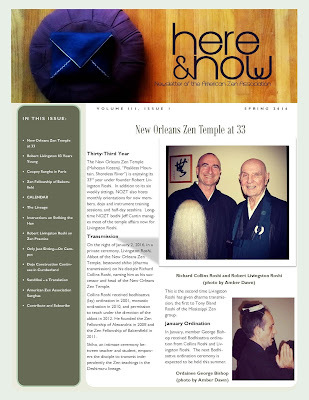 The Lettre de la Sangha Sans Demeure November 2015 issue features an article entitled "Meeting Our American Cousins" (translated into English) which offers a French sangha member's experience at the New Orleans Zen Temple. To read the newsletter, click the Dropbox link below.